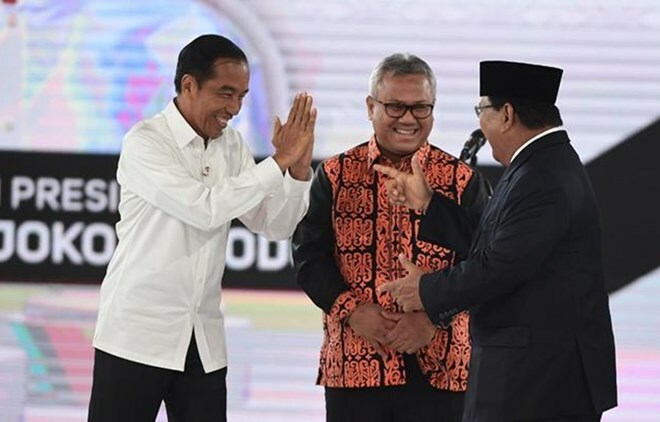 Jakarta (VNA) – There were some major differences on how two Indonesian presidential candidates envisioned the future of Indonesia’s foreign policy, which were conveyed during the fourth face-off between two candidates held in Jakarta on March 30. Commissioner of Indonesia’s General Election Commission (KPU) Wahyu Setiawan said the debate comprised of five segments, similar to the third one. It covered the topics of ideology, governance, security issues, and international relations. In the first segment, candidates conveyed their visions and missions in the field of international relations, and then they responded to assigned questions in the second and third ones and inquire each other in the two remaining parts. The first candidate, incumbent Indonesian President Joko Widodo, highlighted Indonesian capacity in mediating in a number of international conflicts and Indonesia's soft diplomacy power in several international trade negotiations. He also voiced his belief in the capability of the Indonesian Armed Forces (TNI) in defending the country's territorial sovereignty. Meanwhile, the other candidate Prabowo Subianto said Indonesia's defence remains weak due to budget constraint, thus it needs to be enhanced. Both candidates also offered different approaches to strengthen Indonesian diplomacy. President Widodo said that Indonesia has large potential as the world's largest Muslim majority country to involve in the peace process in some conflict areas as well as to increase trade values by using economic diplomacy. Prabowo wanted to increase Indonesia's military equipment for preventive defense mechanism, in which he noted that neighboring countries, like Singapore is more advanced. In addition to the debates, the KPU allows the candidates to launch their campaigns from March 24 to April 13. Indonesia will organise legislative and presidential elections simultaneously on April 17 across the country.